All members of the Center for Advanced Studies are Professors at LMU Munich, but in some cases their sphere of activity extends well beyond the university. In order to provide insights into their work, a series of events is organized for the benefit of other CAS members and fellows. 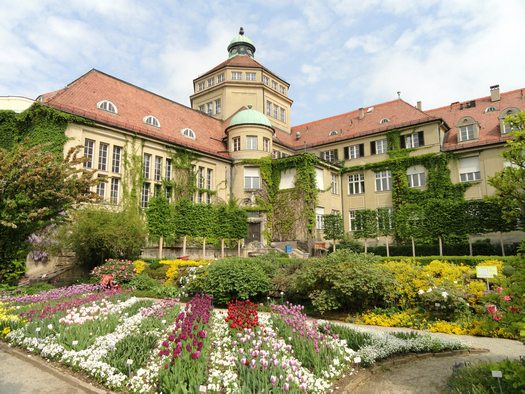 One of those events was an exclusive tour of Munich’s Botanical Garden given by its director Susanne Renner, Professor of Systematic Botany and Mycology at LMU Munich. The tour, which took place on 7 July, gave participants an impression of the spacious grounds of the garden, including the ornamental courtyard, the rock garden and the rhododendron grove, as well as the extended glasshouse complex. Along the way, Professor Renner drew attention to a number of rare or exotic species among the garden's 16,000 plants and explained the significance of the garden for the preservation and study of biodiversity.